Born in Camargo, Chihuahua, Mexico, he studied at the notorious Academia de San Carlos where he joined the student strike of 1911. He also fought during the Mexican Revolution under the command of Venustiano Carranza, earning him the nickname "El Coronelazo". He traveled to Europe and made friends with many main stream artists of the time. Upon his return he joined Jose Clemente Orozco and Diego Rivera as the 20th Century's most influential muralists. They revolutionized mural content and style by portraying Mexico's rich history and contemporary economic problems in visually bold political terms. 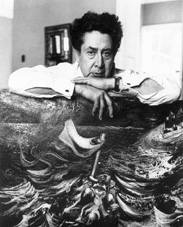 Of the three, Siqueiros was the most influenced by Marxism, as evident by his treatment of the class struggle and his use of modern industrial equipment, such as the airbrush. Public murals, he believed, were a powerful and effective medium to make his work accessible to a broad audience traditionally ignored by elitist art institutions. After becoming Secretary of the Communist Party in 1928, he was frequently jailed or expelled from Mexico and nearly gave up painting. It was during one of these expulsions that he went to Los Angeles. His most productive artistic period began in 1944, when he returned to Mexico after an exile due to allegations of his role in Leon Trotsky's assassination. This fertile period culminated in 1966 with his dramatic murals at Chapultepec Castle depicting the overthrow of the Porfirio Diaz regime.